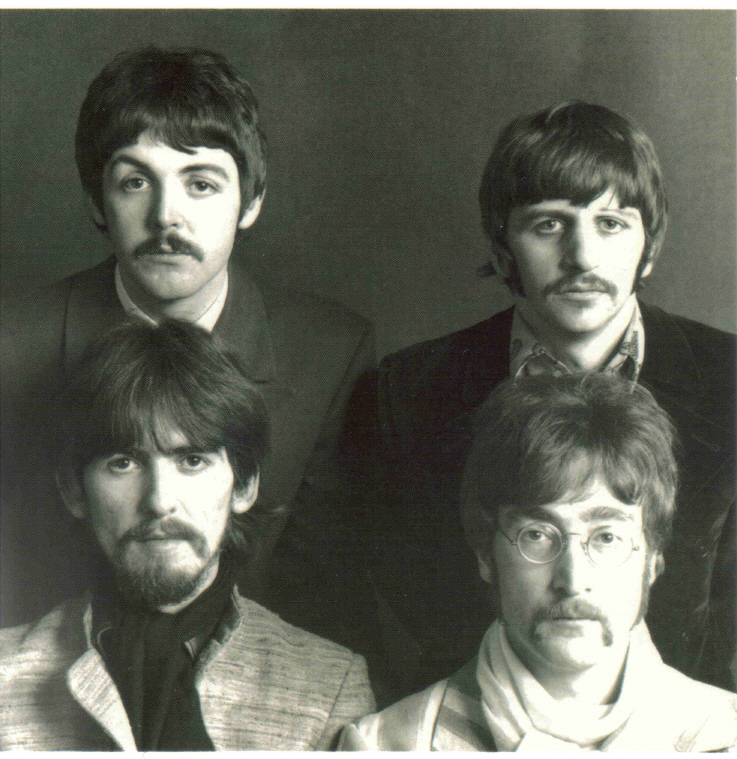 The Beatles Collection » 18. 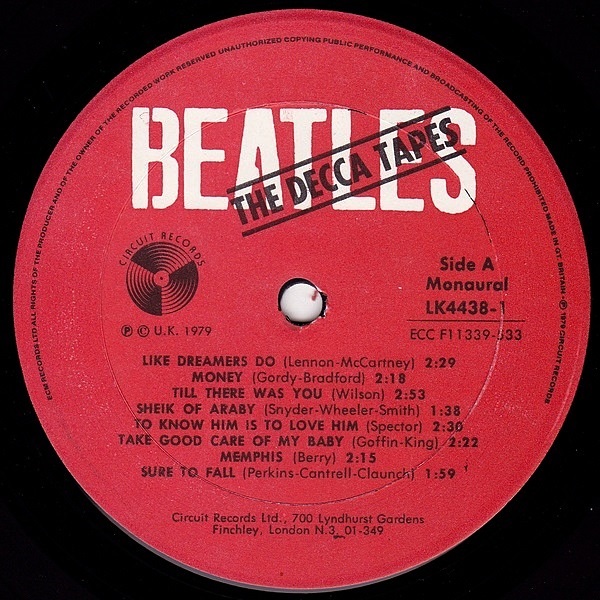 The Decca Tapes. Release, 1979. On New Year’s Eve 1961, The Beatles together with Neil Aspinall loaded their equipment into a van and drove down to London. Brian Epstein travelled by train. Arrived at about 10pm they booked into The Royal Hotel in Russell Square, and then went out on the town to join the New Year revellers in Trafalgar Square. 1 January 1962, the following morning The Beatles arrived at Decca’s West Nampstead studios to find that Brain Epstein was already there. Brian was annoyed, it was approaching 11am, the time of the audition, and no one from Decca had yet arrived. Mike Smith eventually arrived at 11.30 and The Beatles began to unload their equipment only to be told that it wasn’t required and that they were to use the guitars and equipment provided. 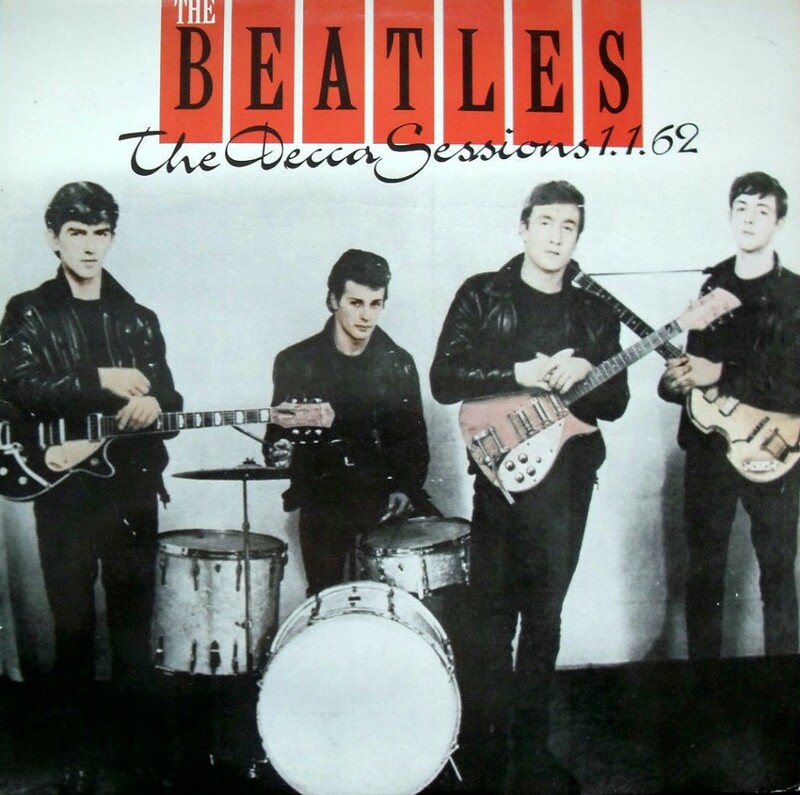 The Beatles, now in the relatively calm and controlled environment of the recording studio, ran through the songs they had selected from their repertoire, eventually recording at least 15 songs, including three of their own that they had included despite Brian’s instructions. The session finished at about 2pm and Mike Smith, impressed with their recordings, told them there would not be an immediate decision, as that would come from higher above. 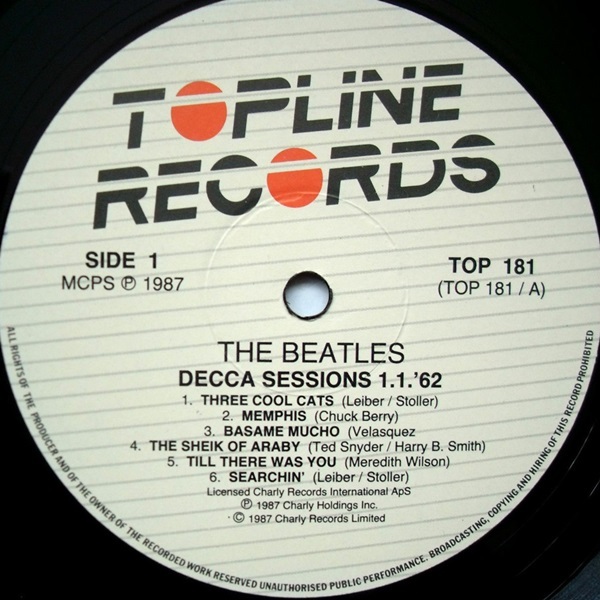 For the first time, all 15 The Beatles tracks recorded on the Decca studios were published on the Circuit Records in 1979. 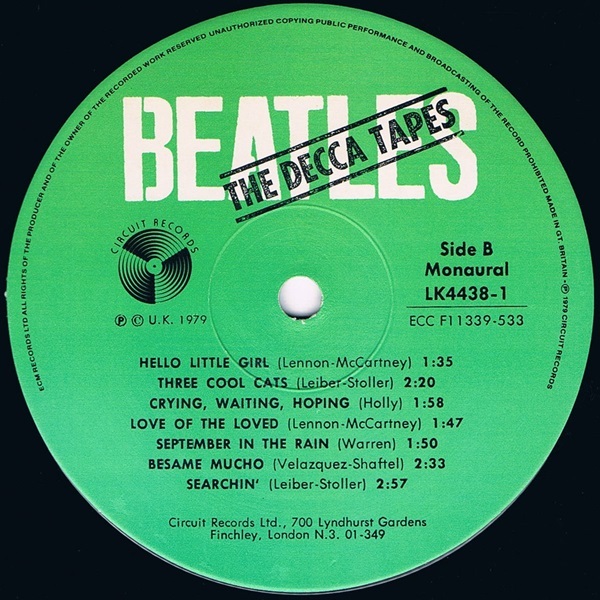 After five years, 12 of the 15 recordings were reissued as The Complete Silver Beatles (AFLP 1047), AFE Records release, 1982. And still after five years, 12 recordings have been reissued as The Decca Sessions 1.1.62 (TOP 181), Topline Records release, 1987. 1. First pressing, 1979. As “Beatles Decca Tapes” LK4438-1, Circuit Records. 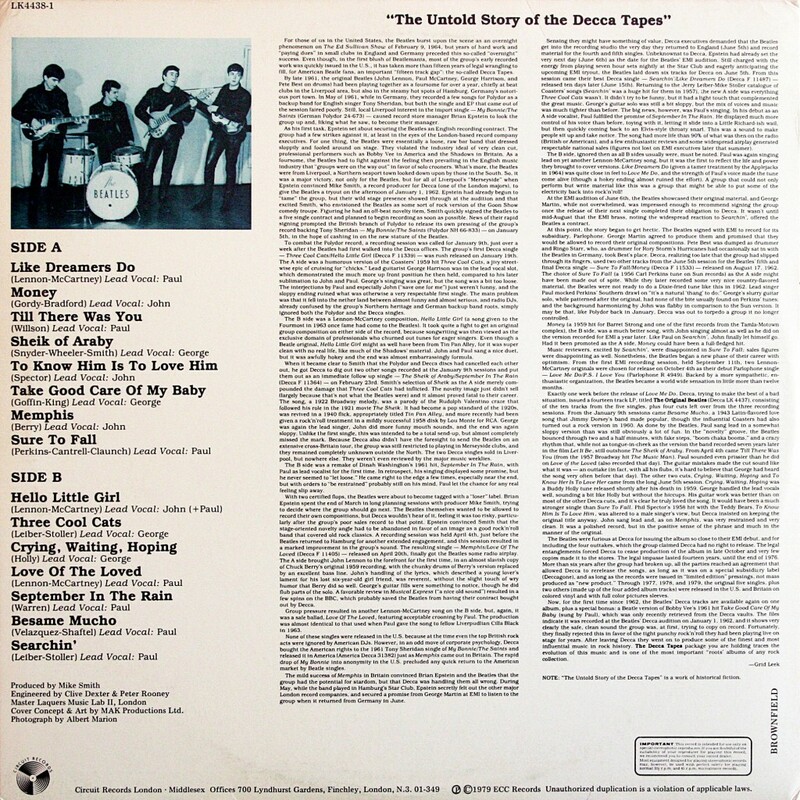 On the reverse side of the sleeve is a work of historical fiction “The Untold Story of Decca Tapes”, author Grid Leek. Variation A: Green labels, possible manufactured by Hayes’s factory, 1979. Matrix numbers: LK 4438-A / LK 4438-B. Variation B: Red labels, and the most prominent groove, which is a similar on Decca presses. But the exact date of making and manufacturer unknown. Possible this edition is a fake. 2. Second pressing. 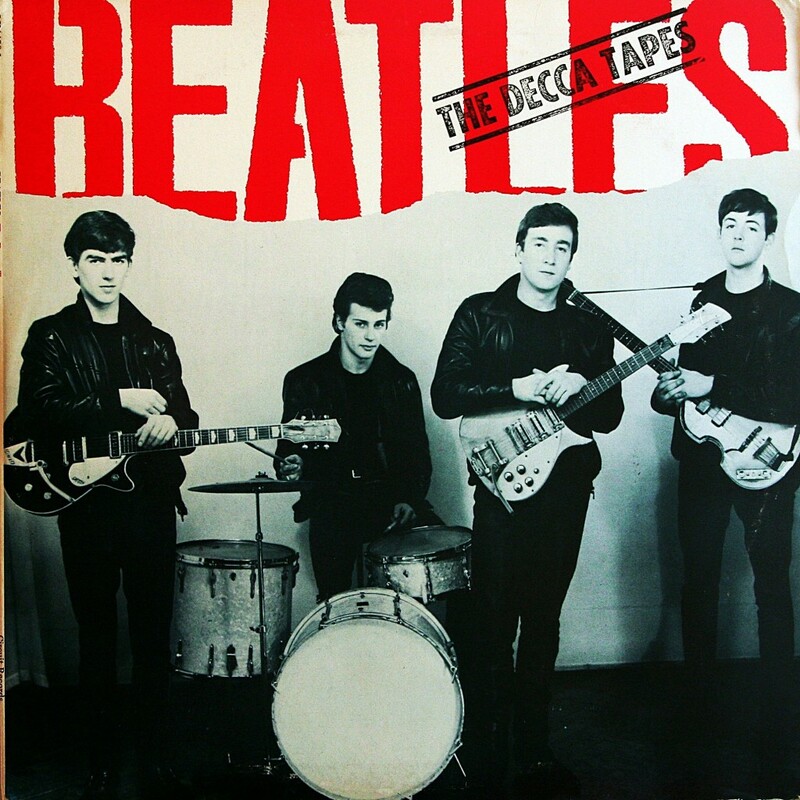 As “The Complete Silver Beatles” AFLP 1047, Audiofidelity Enterprises Records. Released on September 10, 1982. The album contains 12 of the 15 tracks recorded on the Decca studios. 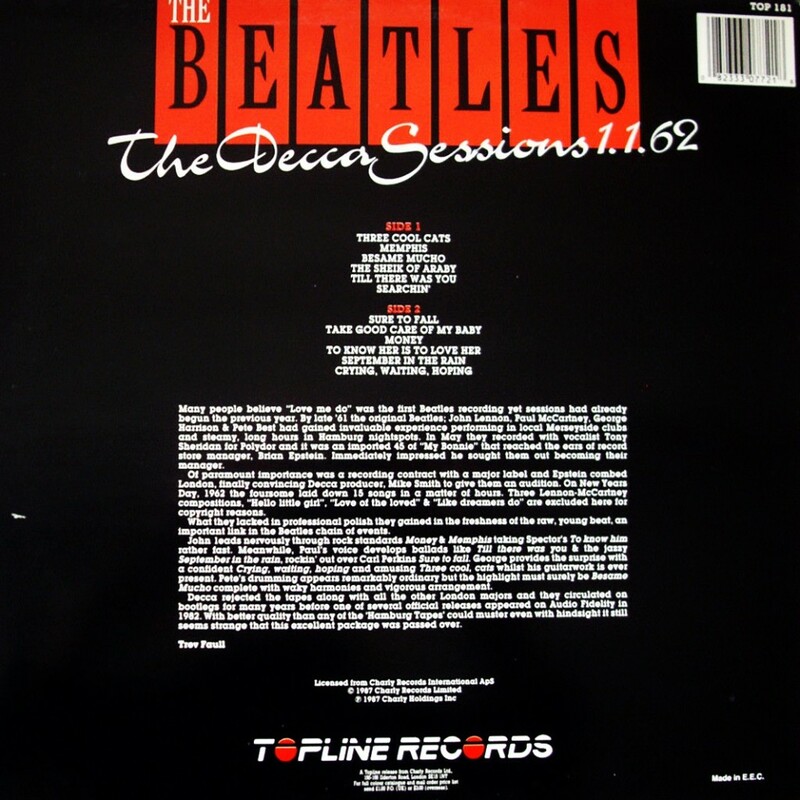 See details in “Beatles on Audiofidelity Enterprises Records”. 3. Third pressing, October 19, 1987. 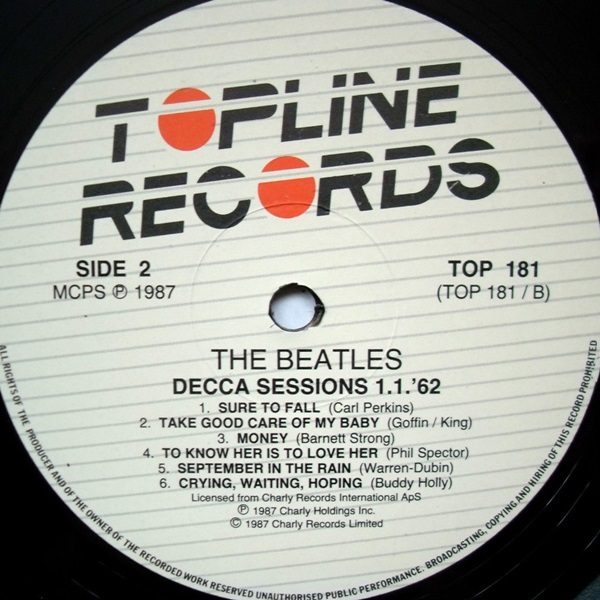 As “The Decca Sessions 1.1.62” TOP 181, Topline Records. 12 tracks.